The 17th Annual Bayou Rendezvous is back and better than ever during Jazz Fest 2019! Satisfied Productions Presents The 17th Annual Bayou Rendezvous Benefiting the New Orleans Musicians Clinic! 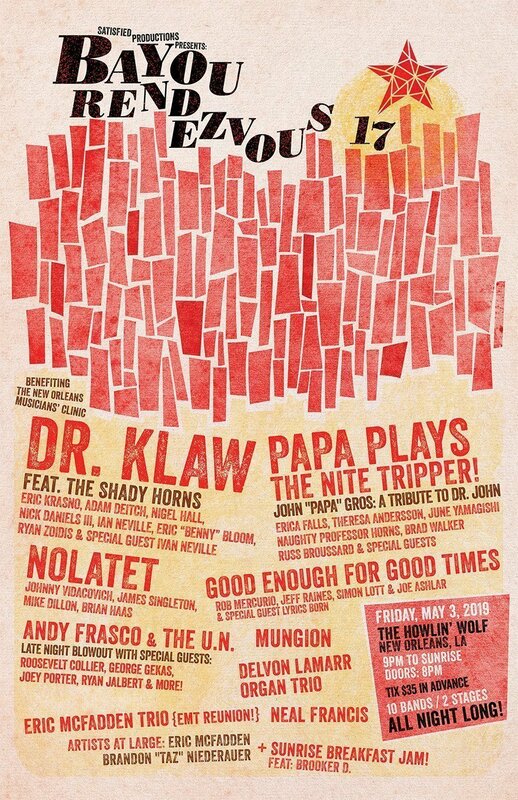 Join an INCREDIBLE lineup of musicians for the 17th year of this annual blowout on the second Friday of Ja of 10 bands on 2 stages at the Howlin’ Wolf to benefit the NOMC. Doors: 8PM, Show:9PM – music goes all night long!